Struggling for storage space? You’ll find the perfect solution right here at Betta Living. Not simply an attractive aesthetic feature, fitted wardrobes provide an excellent storage solution and actually help to maximise space. An unobtrusive built-in wardrobe is the perfect way to de-clutter your room, and with a wide range of beautiful designs available, we can tailor the perfect fitted wardrobe for your space, budget and personality. If you’re on the hunt for a new built-in wardrobe, Betta Living has what you’re looking for. Whether you need more hanging space or shoe storage, handbag storage or spare nooks, we’ll create a bespoke wardrobe tailored to your exact requirements, to complete and de-clutter your bedroom. With an experienced team of designers and fitters on our side, we’re confident that we can find the right fitted wardrobe for you. Looking to improve your storage space? Look no further than Betta Living. We can de-clutter your bedroom while enhancing its look, feel and even size, all with a made-to-measure fitted wardrobe. 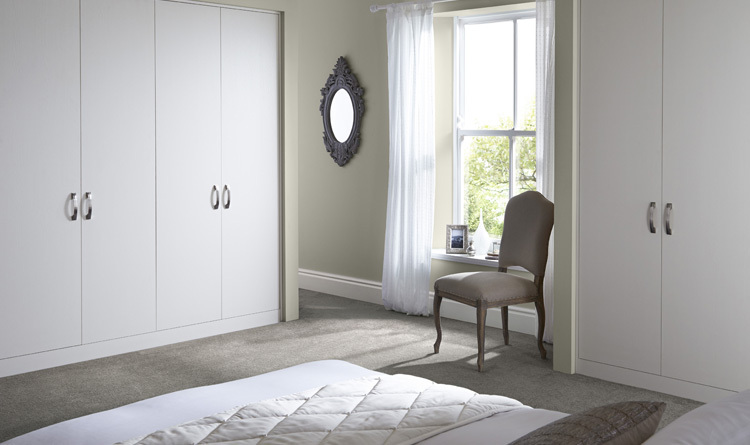 Choose from a diverse range of fitted wardrobes in a variety of colours and designs . Complete your bedroom with a built-in wardrobe that saves on space, while increasing storage. Feel confident in the knowledge that you’re in safe hands – our professional installation specialists will work their very hardest to minimise disruption to your home. Request a free brochure to browse our full range.